Nestled among the mountains of a picturesque rural community in Western North Carolina, Andrews Elementary is one of the largest Pre-K through 4th-grade elementary schools in Cherokee County. Throughout the years, AES has repeatedly been recognized as a School of Distinction and as an Honors School of Excellence. For the last two consecutive years, we have met or exceeded expected growth and scored a "B" on the state report card. Our Principal, Melissa Godfrey, was selected as the Western Regional Principal of the year for 2017-2018.
AES is dedicated to promoting healthy lifestyles. All students receive a free breakfast and lunch. Teachers have high expectations for their students and teach desired behaviors using our PBIS Matrix. All of our students also enjoy regular guidance sessions with our school counselor. At AES we feel integrating technology within our instructional processes is important. We have a 1:1 Chromebook ratio with our students in grades three through four. All of our classrooms have interactive Promethean Boards or Smartboards to further engage our students in their learning. We also have a computer lab with an interactive Smartboard. We have a mobile iPad cart and multiple iPads in each classroom to offer teachers other modes with which to offer instruction. Andrews Elementary has an experienced staff that is fully licensed in the areas they teach. Our lead teachers have advanced degrees and/or have National Board Certification in their content area. Faculty and staff strive to meet high academic standards as they continue to focus on the needs of all students. Through systematic and regular assessment of our students and ourselves, Andrews Elementary will continue to be a great place to learn. 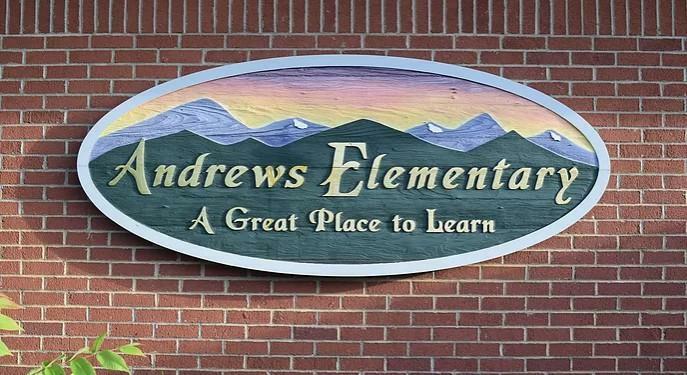 If you are interested in your child attending Andrews Elementary please contact the school office at 828-321-4415. Mission: To prepare all students to contribute and thrive as productive citizens in the community, in the country, and in the world. Vision: To ensure all students are educated in a nurturing environment accompanied by a relevant, rigorous curriculum by highly qualified educators. Every student will meet or exceed the expected proficiency for their respective grade level in math and reading. Every student will demonstrate appropriate school behavior by following the expectations as outlined on our PBIS matrix. Each student will have adequate access to technology resources to support academic growth.